Meet our new methylized B product, Methyl-B Supreme™. While it is especially formulated for those with difficulty utilizing the more common folate products, you will want to check out this dynamic new product for yourself. It’s great for nerve damage support, serenity and relaxation, and potent antioxidant protection. That’s because we have added B12 and fat soluable; B1, B2, B3, and B6. That’s not all......we added Biotin, Pantothenic acid, DMG, and Alpha Lipoic Acid! 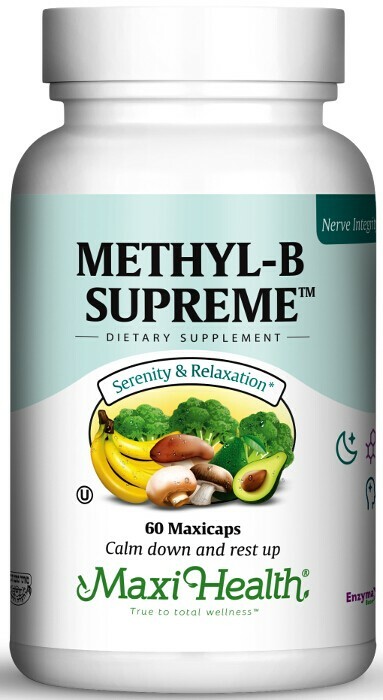 That’s why we call it supreme, Methyl-B Supreme™! Get yours today. Directions: Take one (1) Maxicap™ once or twice daily, or as directed. Contains soy. This product contains NO animal products, wheat, sugar, salt, yeast, gluten, milk, artiﬁcial ﬂavors, colorings or preservatives. This product was manufactured in an NSF GMP Certiﬁed facility. Enzymax , a vital digestive enzyme complex, is a registered trademark of Maxi Health Research ® LLC. Pantesin® is a registered® trademark of Daiichi Fine Chemical Co.